With its use of catchy slogans (“Tippecanoe and Tyler Too”), rallies, songs, banners and ribbons, the 1840 presidential contest between incumbent Martin Van Buren and the Whig Party’s William Henry Harrison marked the beginning of the modern era of campaigning. Then as now, predictions about the outcome also enlivened the process. 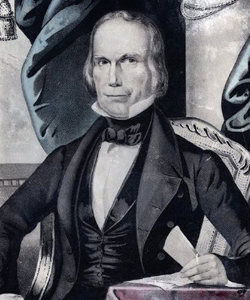 That fall, Henry Clay sat down at his Lexington, Kentucky home, Ashland, to forecast the election results in response to a request from the Tippecanoe Club of Rushville, New York. At the time, there was no single Election Day: states voted for their presidential electors between October 30 and December 2, and the electors then met to vote for the next chief executive. The Whigs had done well in most down-ballot races held in the preceding months, and Clay–who had lost the Whig nomination to Harrison, one of five tries he would make for the presidency–was in a good position to assess the race. He got things nearly, but not exactly right. Of the 26 states in the Union, Clay believed that Van Buren “would not obtain the votes of more than six.” (He got seven). Although down-ballot elections in Illinois had been disappointing for the Whigs, Clay was confident that “her vote will be cast in Nov. for W. H. Harrison” (He was mistaken). He also conceded Maine to Van Buren (Harrison, in fact, won the state). Otherwise, despite his lack of computer models and sophisticated polling, Clay would not have been embarrassed to compare his predictions with the actual result: Van Buren’s 7 states brought 60 electoral votes, but Harrison’s 19 states and 234 electoral votes gave him the victory. 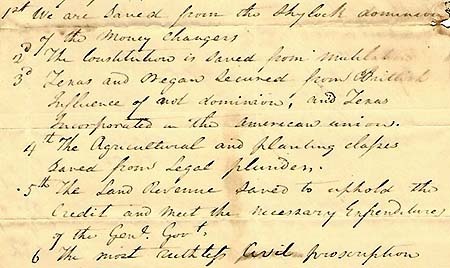 Henry Clay’s letter to the Tippecanoe Club is part of the Manuscripts & Folklife Archives collections of WKU’s Department of Library Special Collections. Click here to access a finding aid. For more collections about Henry Clay and about other presidential elections, search TopSCHOLAR and KenCat. 1st We are saved from the Shylock dominion of the money changers. 2nd The Constitution is saved from mutilation . . . .
4th The agricultural and planting classes saved from legal plunder . . . .
7th National debt funding system, British influence and finally a dissolution of the Union all, all prevented by the gallant brave & virtuous democracy of the Union . . .
9th Our prospect is brightened to rescue our beloved state from the extravagant and corrupt rule of modern Whiggery. Elijah Hise’s letter is part of the Manuscripts & Folklife Archives collections of WKU’s Department of Library Special Collections. Click here for a finding aid. For more of our political collections, search TopSCHOLAR and KenCat. When last we left the Whigs, they were fighting the presidential race of 1844, pitting their candidate, Kentucky’s Henry Clay, against Tennessee Democrat James K. Polk. Both parties had dumped their presumptive heirs to the nomination, Vice President John Tyler and former President Martin Van Buren, respectively. With their nation poised to become a continental power, the Whigs and Dems sparred bitterly over the annexation of Texas and Oregon, Manifest Destiny, and the westward expansion of slavery (Polk was for, Clay against). But economic issues such as the tariff (Polk wanted to lower it) also hovered in the background. Voting began on November 1–this was the last presidential election to be held on different days in different states–and when it concluded on December 4, 1844, Polk was declared the winner by a narrow margin. In Elkton, Kentucky, 53-year-old Elizabeth Martin found herself on the wrong side of the vote (had she been able to vote, that is). Writing to her nephew Benjamin Hinch, she mourned the outcome as “a grate calamity indeed” that left the defeated Whigs “all down in the mouth.” Elizabeth’s daughter Avaline was also disappointed. “The times are very hard with us,” and were likely to continue “since they have elected old Polk.” But this joint mother-daughter letter included another, more personal debate, as the women earnestly proposed suitable names for Hinch’s newborn son. Elizabeth and Avaline Martin’s letter is part of the Manuscripts & Folklife Archives collections of WKU’s Department of Library Special Collections. Click here to access a finding aid. For more collections about politics, search TopSCHOLAR and KenCat. The time has come when the American people should feel and know that this great great country of theirs, belongs not to office holders and office seekers, but to them. A most momentous crisis is at hand in the history of our beloved country…Great principles are in issue. The Whigs are the advocates of an AMERICAN tariff…discriminating in the amount of duty imposed, between those articles which the American citizen can manufacture or produce and those which they can not… Providence…has filled our mountains and our plains with minerals…and given us a climate and soil for the growing of hemp and wool. These being the great materials of our national defence, they ought to have extended to them adequate and fair protection. 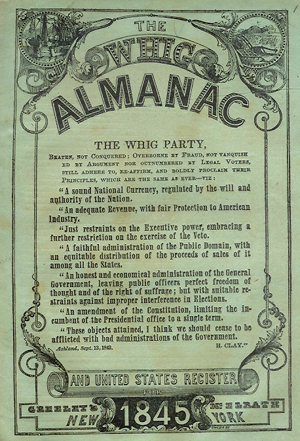 The Whigs are in favor of a well regulated Bank of the United States; of a reduction and reform of the expenditures of Government, and a modification of the executive powers of the President. Remembering that we are one people, in town and country all the same, elevated by the same prosperity, depressed by the same misfortunes, subject to the same laws and warmed by the same patriotism, let us unite together as one man [sic] around our principles and sustain our men [sic] and our measures by our suffrages at the polls. A typescript of this Whiggish appeal is part of the Manuscripts & Folklife Archives collections of WKU’s Department of Library Special Collections. Click here to access a finding aid. For other collections about elections, search TopSCHOLAR and KenCat. And don’t forget to vote! The Warren County Public Library’s American History speaker series concludes October 13 with David and Jeanne Heidler, bestselling authors of Henry Clay: The Essential American. 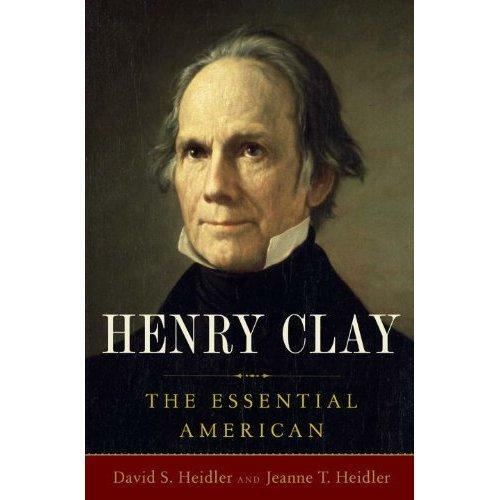 Their most recent work is Henry Clay: The Essential American. The Heidlers present Clay in his early years as a precocious, witty, and optimistic Virginia farm boy who at the age of twenty transformed himself into an attorney. They reveal Clay’s tumultuous career in Washington, including his participation in the deadlocked election of 1824 that haunted him for the rest of his career, and shine new light on Clay’s marriage to plain, wealthy Lucretia Hart, a union that lasted fifty-three years and produced eleven children. The Heidlers will speak at Christ Episcopal Church (next door to the Main Library) on Thursday, October 13 at 6:00 p.m.
WKU Students will be able to swipe their student ID for these events. For more information about these events, call 270-781-4882.